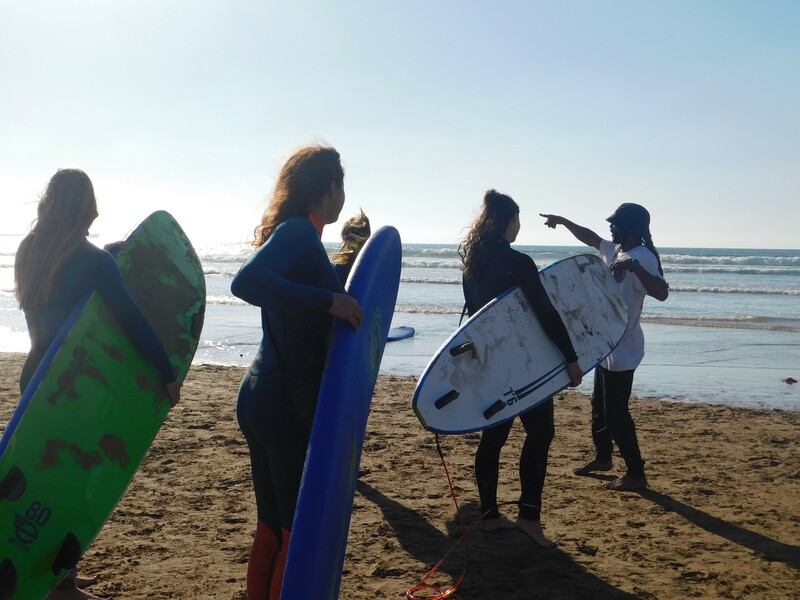 Beginner surflessons in Morocco - Learn to surf in easy steps! You have never surfed before or only a few times? No problem! 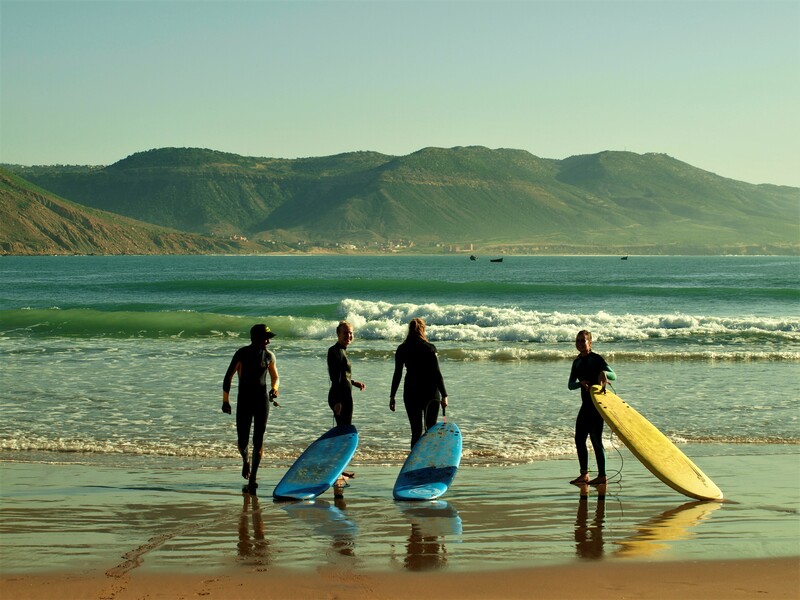 In our beginners lessons we learn you the basics of surfing. With the good basics you can progress fast and you will stand up on your board in no time, riding your first wave! In the begin of the day we start on the beach to practice. 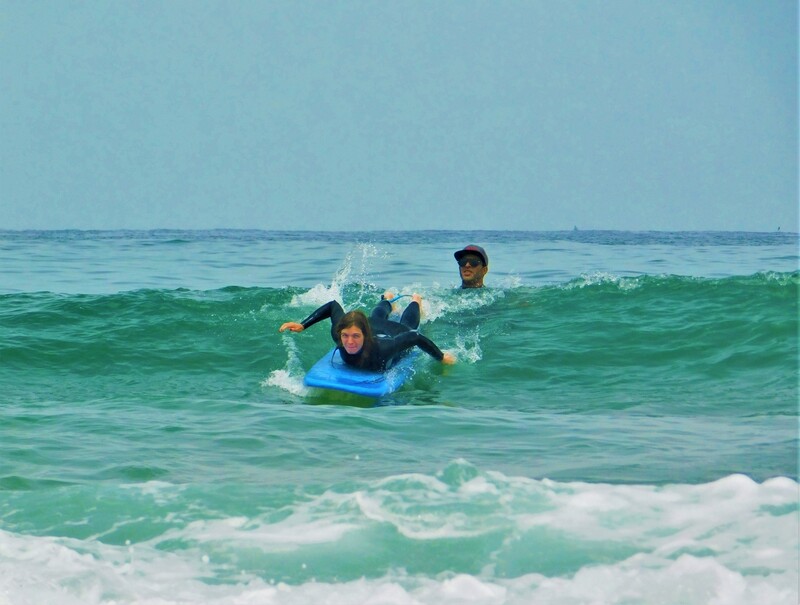 Then we go into the water and the surfteacher will help you to stand on your board and take waves. The best surfers are the one with the most fun. Enjoy the waves, sun and people! 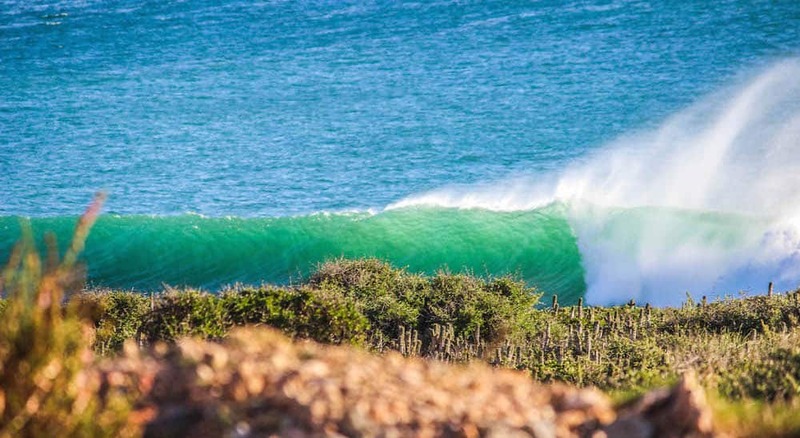 Learn to surf epic waves of Morocco! It is a big dream for a lot of us. 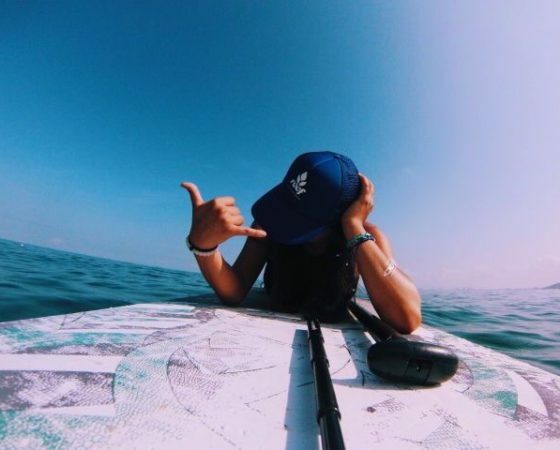 Surfing on empty beaches, taking andless waves, chill afterwards under palmtrees and making a campfire, living by the tides… The surfers lifestyle attracts us. But you still didn’t make the step to your first surflesson. 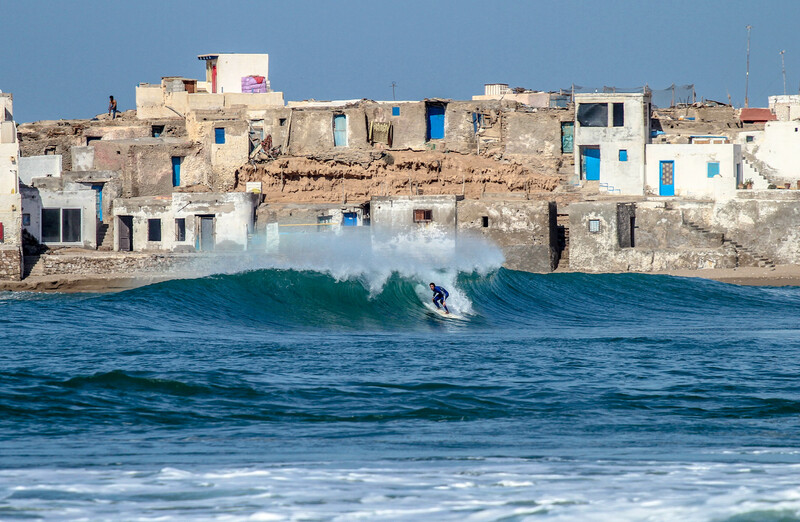 Why surflessons with Surf Paradise Morocco? 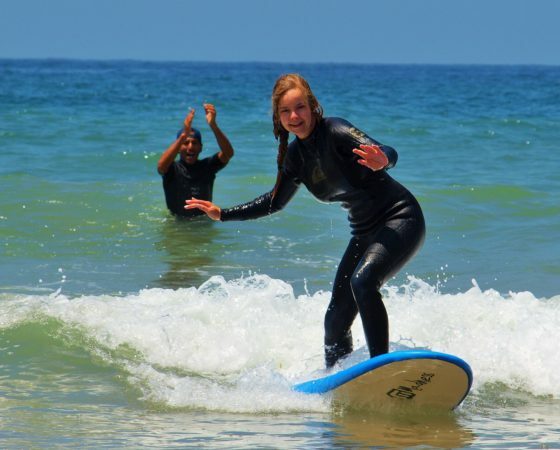 We would love to give you your first fantastic surfexperience. 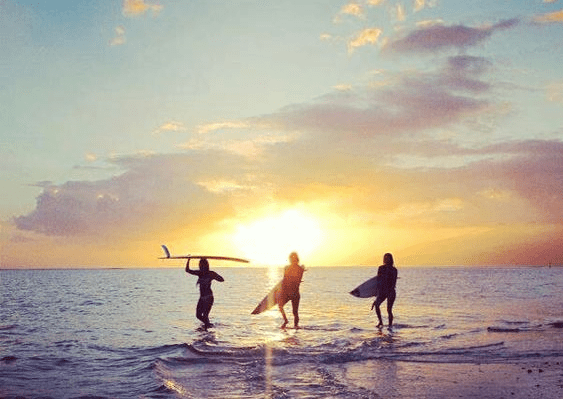 Surfing is our passion, our job and our life, and we are delighted to show you all of it! 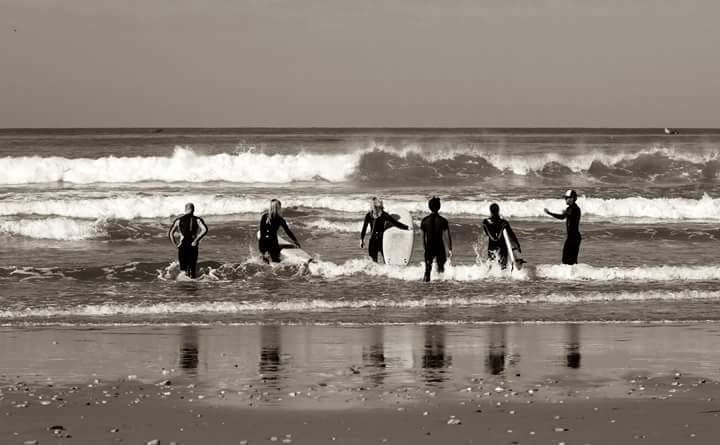 But what is the difference between our surfcamp and other surfschools/surfcamps? You will get the best instructors possible! 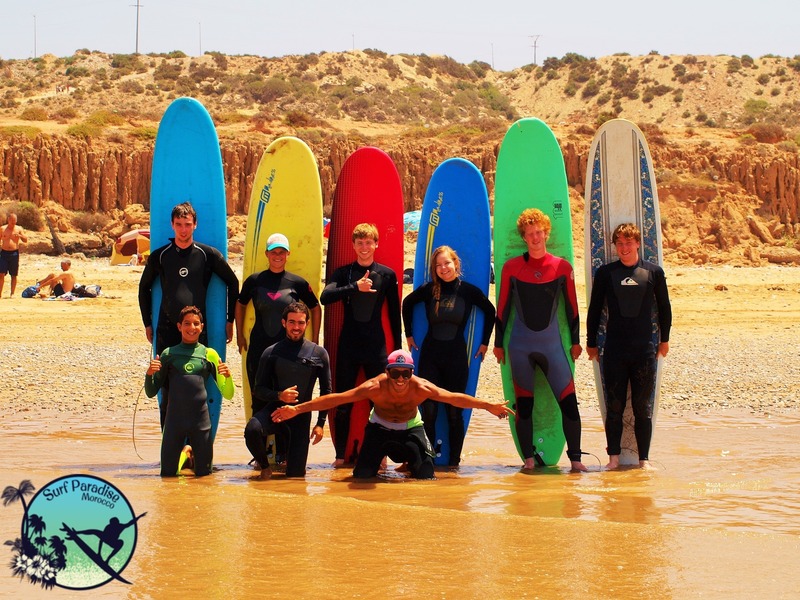 Get professional surflessons from A Moroccan surfchampion: Zouhir Houmay and ISA certificated surfinstructors. 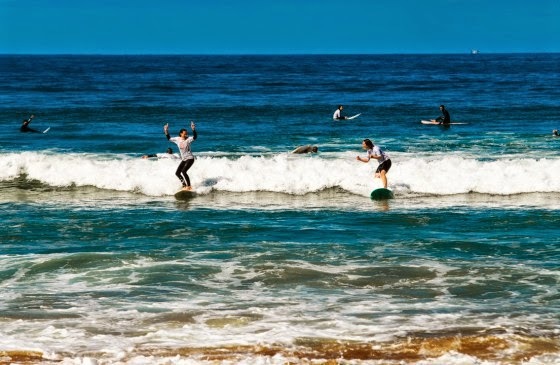 Learn to surf in 3 easy steps: Our 3step method is approachable for everyone… yes also for you! You will get personal coaching, from people who are very passionate about surfing, they are stoked to see you taking your first wave! Small groups sorted on surflevel, so the lessons are focused on what you need. Maximum 6 students per surfinstructor. 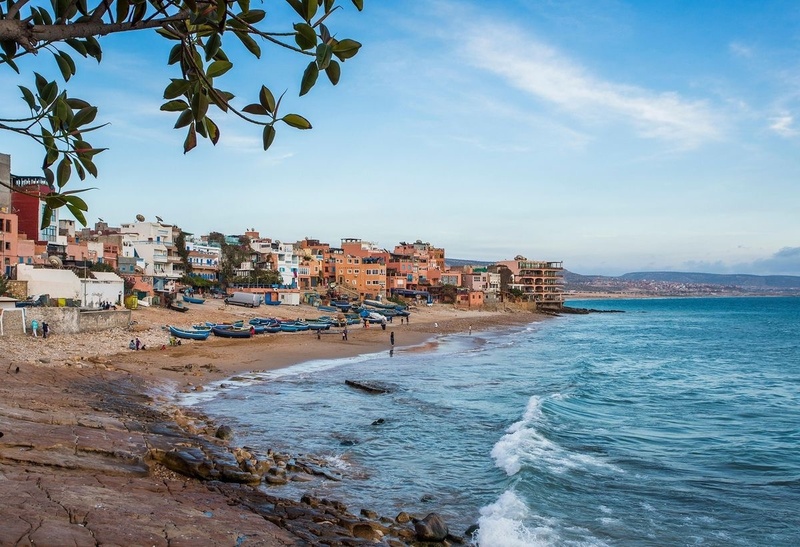 Most of the time we don’t surf on the most nearby beach but daily we’re searching for the perfect waves for you: Perfect conditions on the Moroccan coast line make it much easier to progress! 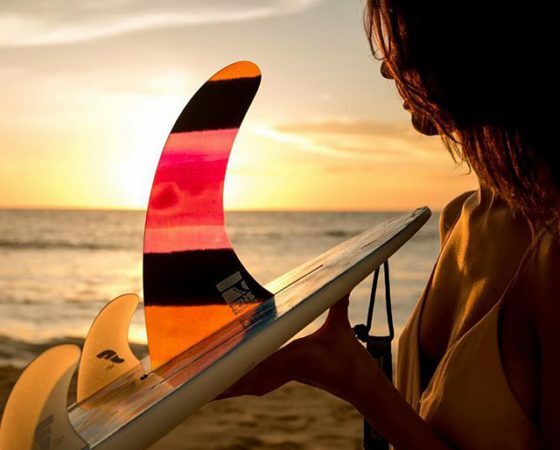 We use great quality of sufttop surfboards, that suits your size. This make sure that your learning progress will go faster and it is easier to catch a wave and to take your balance. Our new wetsuits are perfect for the ocean conditions in this area. Stay warm so you can practice longer without getting muscle strain. 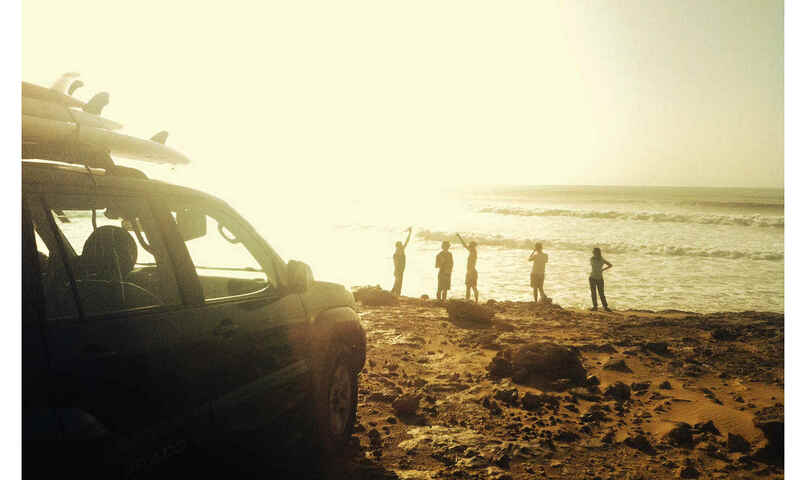 10:00 We leave our surfcamp to drive to the best surfspot! We wait for the best waves and high tide! Step 1. What is the right position on your surfboard? If you want to catch a wave, the wave need to push you to get speed. It is very important that your weight is devided on your board. Step 2. How to stand up? Once you make speed and you are in the wave, you can start your way up. There are multiple ways to get into your standing position. Some people also call this your pop-up. Step 3. How to keep your balance while you are standing on your surfboard? As soon you are standing you need to keep your balance while surfing. Bend your knies and look into the right direction. This is one of the most difficult parts of surfing. 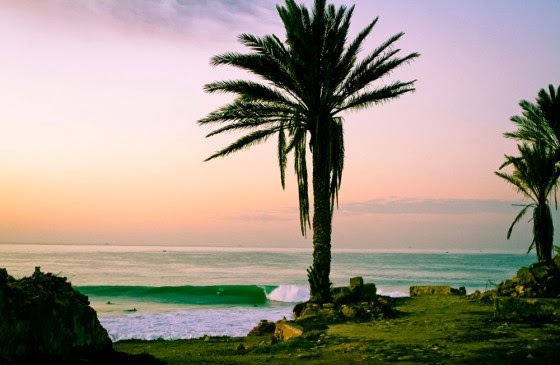 Where to surf in Morocco? 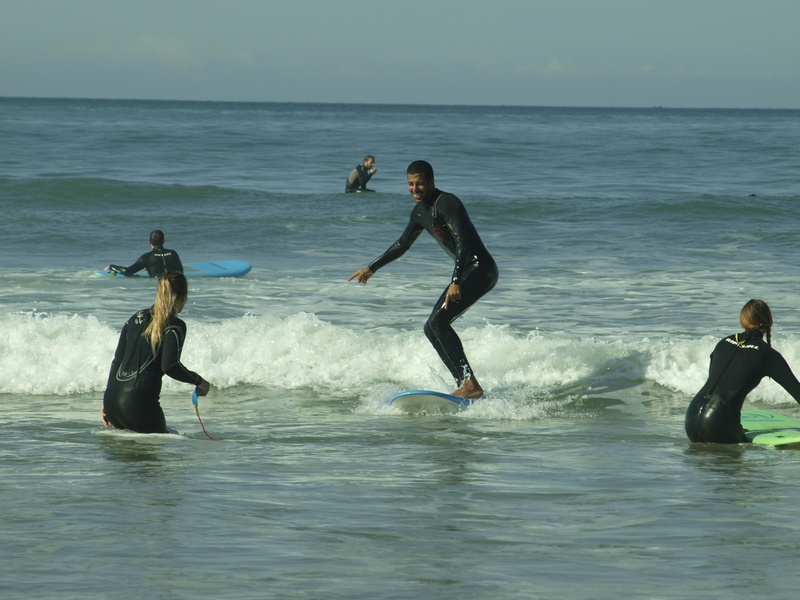 At our surfschool we find it really important that the waves are suitable for your surflessons. 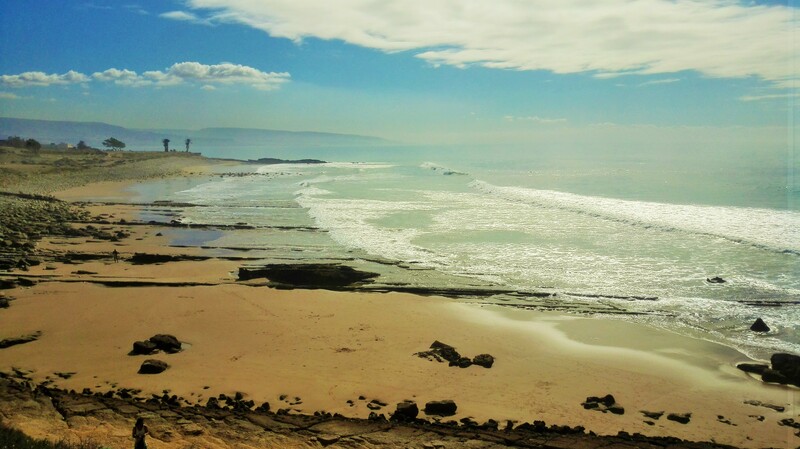 We carefully choose our surfspot of the day to create the best surf environment to learn how to surf. It is never helpful if the current is too strong, or if you surf with low tide and the waves are not working. 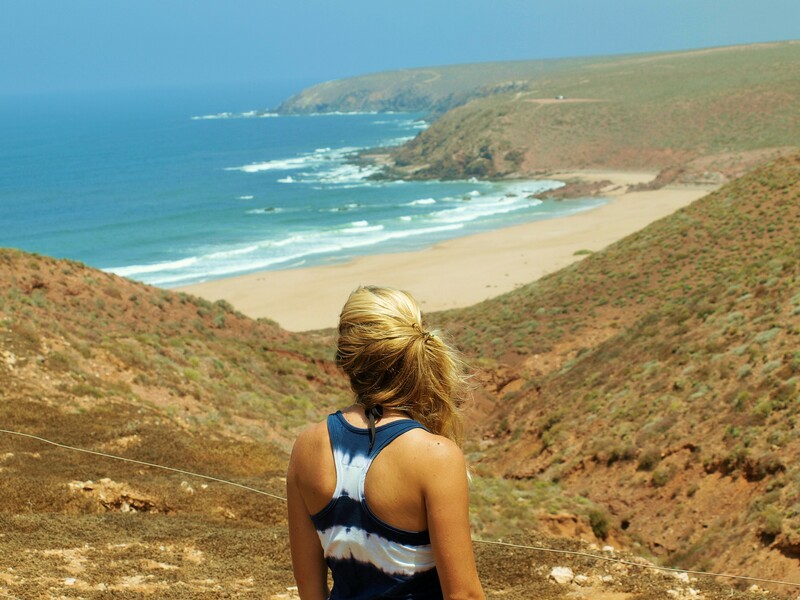 For your first surflesson we choose a surfspot with broken waves on a sandy beach. We surf during high tide and the current don’t need to be too strong. This are the perfect conditions for your first surfday. For your following surflessons in the week we might choose a surfspot with slightly stronger waves so you can get used of the ocean with stronger waves. But we will never choose a surfspot that is above of your level or dangerous. While some surfschools will be already in the water, we can ask you to wait for high tide. Why do we do this? If you take a better look to the ocean you might see that it is low tide. The surfers that are in the water will not catch any waves at all and they lose their energy by peddling for the waves they will never be able catch. High tide will give stronger waves that are easier to surf, so this waves are more suitable for your first surflessons. This area has countless of surfspots. There is always a beach that is suitable for beginner surfers. Surfspots around the surfcamp are: Banana beach, and Devils rock. 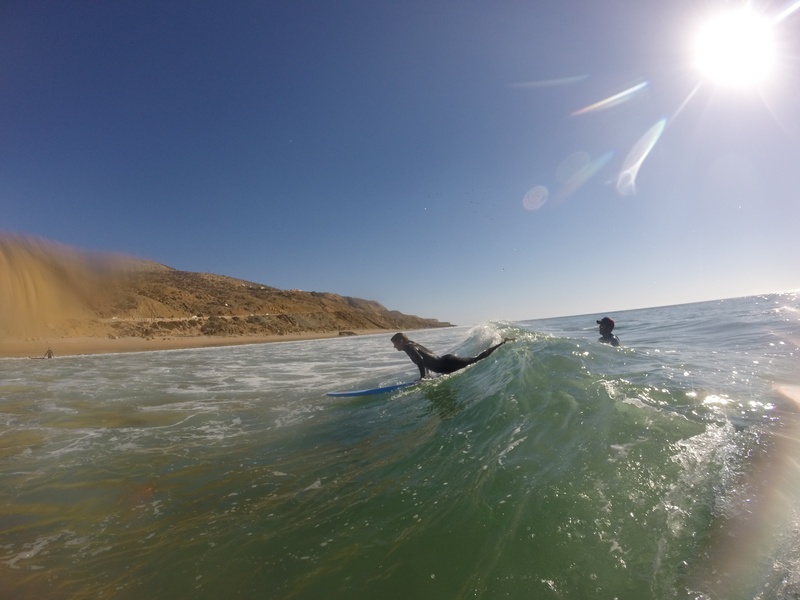 Other surfspots where we surf often with our beginner surfclasses are: Camel Beach, Anza and Key16. 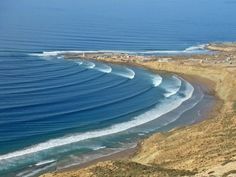 Once in a week we organise a surftrip to Imesouane or Tifnit. If you start with surfing you should always use a softtop surfboard. This surfboards are made of foam and are always softer than longboards and shortboards, they also don’t have pointy noses and tails. If you fall on this surfboard it will give less damage. However the 3 fins of the surfboard are always sharp. The size and volume of the surfboard need to fit your size. With a bigger board with more volume it’s easier to catch a wave and the board will remains stable in the water. “left” – a left is a wave that is breaking to the left. The direction “Left” is used by the surfer when describing the direction of the wave while facing shore. Therefore, from the beach, a “left” is described as a wave that breaks from left to right. 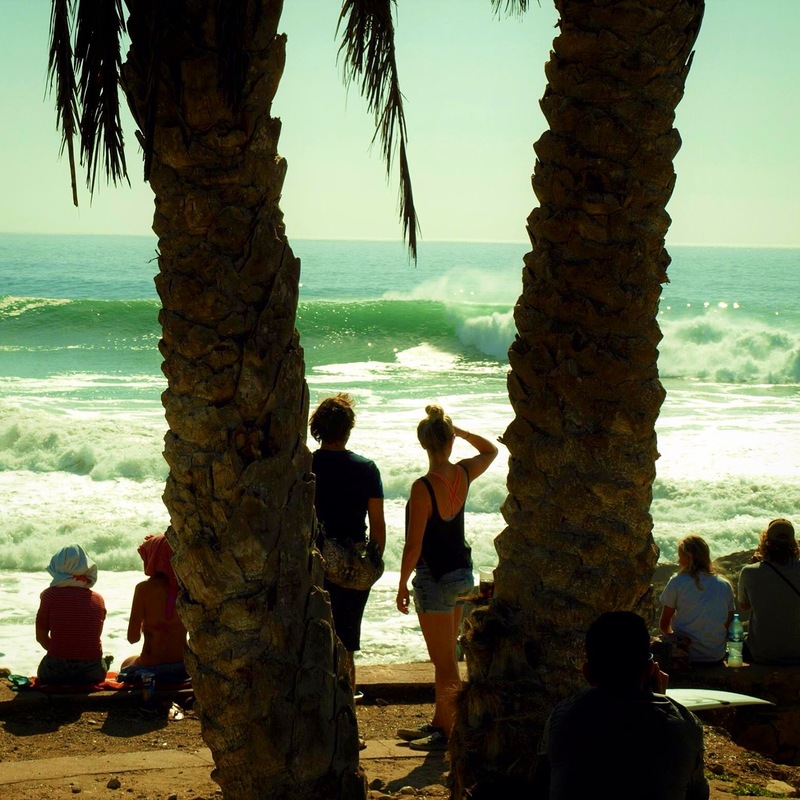 “lineup” – the area where the waves normally begin breaking. Surfers sit on their boards in the lineup and wait for waves to break. The surfinstructor will always be with you during your surfsession. He secure your savety and guide you trough your surfsession. The first thing to keep in mind that in and out the water always keep respect for eachother, give eachother space and have fun together. However it can also be useful to know the 4 basic rules of surfing.